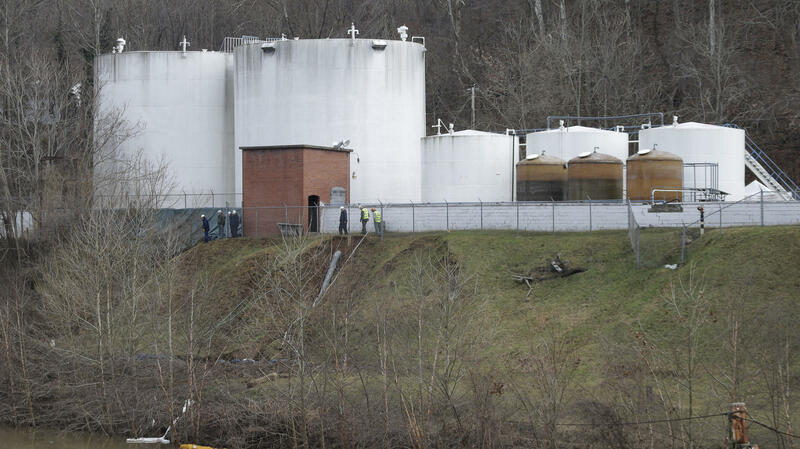 Workers inspect an area near storage tanks where a chemical leaked into the Elk River at Freedom Industries storage facility in Charleston, W.Va., on Jan. 13. It is still unclear exactly how much of the chemicals leaked into the area's water supply. State officials in West Virginia say that in most areas, they can no longer detect any of the industrial chemical MCHM that spilled into the water supply recently. They say the water is safe for people to drink and use — including most pregnant women. But other public health specialists say they don't trust these assurances. "I think there's no way to know what the safe levels of the chemicals are at this point," says Dr. Rahul Gupta, director of the state's largest public health department. He's in charge of protecting 250,000 people whose water was affected by the spill. No matter what federal and state officials say, Gupta says his own family doesn't trust the water supply. The water in his home still has a chemical smell like licorice, he says. He and his wife, who is also a physician, have two teenage sons. "They have decided not to drink the water at this time," Gupta says. "I have personally tried to drink the water. The smell just ... prevents me from drinking the water, unfortunately." More than three weeks after the chemicals were found to have poured into the water supply, public health specialists in government, at universities and in public interest groups say there are still more troubling questions than answers. No one even knows for sure exactly what chemicals, and how much, spilled. The company first said 5,000 gallons of the chemical MCHM had spilled; then it said the figure was more like 7,500. Now it's saying more like 10,000 gallons. Plus, it turns out another chemical, called PPH, leaked, too. "It feels a bit like a Keystone Cops episode, where one crazy thing is followed by another," says Richard Denison, a toxicologist at the Environmental Defense Fund. He has served on advisory boards for the federal government and for the chemicals industry. Denison points out that just one day after the spill, officials at the national Centers for Disease Control and Prevention proclaimed that the water was safe. Well, they didn't exactly say "safe." Vikas Kapil, the CDC's chief medical officer in charge of environmental health, said that at exposures below 1 part per million of MCHM, "we would not expect any adverse health effects." So Denison and other health specialists asked the CDC how it came up with the 1 part per million figure. The agency took days to answer, but it finally said the figure was based on a rat study done back in 1990 at Eastman Kodak Co.
"I was really shocked," Denison says. That study does not suggest that 1 part per million is safe. Lynn Goldman, who used to run the Environmental Protection Agency's toxic chemicals division, says that news also left her dismayed. "That study wouldn't have been enough to come up with a definitive number that would say, '1 part per million, that's a safe number,' " says Goldman, who is now the dean of public health at George Washington University. Goldman says the Eastman Kodak study is a good step toward trying to understand how MCHM affects people, since federal laws don't require companies to study how most chemicals affect people. But the study is seriously limited, Goldman says, because it looked only at how MCHM might affect adults, in this case by testing it on grown rats. The researchers didn't consider how the chemical might affect fetuses or newborns. And Goldman says history shows that a lot of chemicals that don't hurt adults can wreak havoc on the young. So, would she use the water in West Virginia today? "I think if I could still smell or taste the substance in the water, I wouldn't use the water," she says. The CDC website does say that "few studies on this specialized chemical exist." The data simply aren't available, says the CDC's Vikas Kapil. "There are many circumstances in which we would of course like to have more information about human toxicologic evaluations [and] additional animal studies. ... We simply don't have that kind of data available," he says. The CDC website adds: "If you have any concerns, please consult your doctor." And I'm David Greene, good morning. We have been hearing that the chemical crisis in West Virginia's water is pretty much over. State officials say they can no longer detect any of the industrial chemical that spilled, called MCHM, in most areas. So they say based on federal guidelines, the water is safe for people to drink and use. But NPR's Daniel Zwerdling reports that other public health specialists say they don't trust those assurances. Do you feel confident that federal health officials know what levels of these chemicals are safe or not? DR. RAHUL GUPTA: I think there's no way to know what the safe levels of the chemicals are at this point. ZWERDLING: In fact, Gupta says his own family doesn't trust the water supply - no matter what federal and state officials say. His wife is a physician, like he is. They have two teenage sons, and Gupta says the water in their home still has that chemical smell of licorice. GUPTA: They have decided not to drink the water at this time. I have personally tried to drink the water. The smell just keeps me - prevents me from drinking the water, unfortunately. ZWERDLING: I've been talking with public health specialists in government, in universities, in public interest groups. And they say, here we are more than three weeks since the chemicals poured into the drinking water and still there are more troubling questions than answers about whether the spill might affect public health. Not to mention the fact that no one knows for sure how much chemicals really spilled, and exactly which chemicals spilled. The company first said it was 5,000 gallons of MCHM. Then they said, no, more like 7500 gallons. Now they're saying, well, probably more like 10,000 gallons. Plus, it turns out another chemical leaked, too, called PPH. RICHARD DENISON: It feels a bit like a Keystone Cops episode, where one crazy thing is followed by another. ZWERDLING: Richard Denison is a toxicologist at the Environmental Defense Fund. He's served on advisory boards for the federal government and for the chemicals industry. And Denison says Consider this: Just one day after the spill, officials at the National Centers for Disease Control proclaimed that the water was safe. Well, they didn't exactly call the water safe. VIKAS KAPIL: We believe that at exposures below that level, we would not expect any adverse health affects. ZWERDLING: So Denison and other health specialists asked the CDC: How'd you come up with that number, one part per million? The CDC took days to answer but they finally said: We based it on a rat study done back in 1990 at Eastman Kodak. DENISON: I was really shocked. ZWERDLING: Because Denison says that study does not suggest that one part per million is safe. And when Lynn Goldman heard the news, she was also dismayed. LYNN GOLDMAN: That study wouldn't have been enough to come up with a definitive number that would say one part per million, that's a safe number. ZWERDLING: Goldman is dean of Public Health at George Washington University. She used to run the toxic chemicals division at EPA. Goldman says Eastman's study was a good step toward trying to understand how MCHM affects people. But she says Eastman's study is seriously limited. The study looked only at how MCHM might affect adults; in this case, by testing it on grown rats. The researchers didn't consider how the chemical might affect fetuses or newborns. And Goldman says history shows that lots of chemicals don't hurt adults but they wreak havoc on the young. So today, if you were living in West Virginia, would you use the water? GOLDMAN: I think if I could still smell or taste the substance in the water, I wouldn't use the water. ZWERDLING: The CDC's website does say, quote, "Few studies on this specialized chemical exist," unquote. The CDC's Kapil puts it like this. KAPIL: There are many circumstances in which we would, of course, would like to have more information about human toxicologic evaluations, additional animal studies, and we simply don't have that kind of data available. ZWERDLING: The CDC website adds: If you have any concerns, please consult your doctor.